The Rev. Patrick Toomey, CSV, founder of the Guardian Angel Church and a leader in the local Catholic community, died October 12, 1986 in Illinois. He was 70. 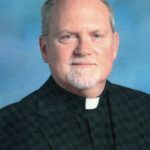 Toomey was born in Butte, Montana, and moved to Las Vegas in 1961 to serve as pastor of St. Viator, where his parish consisted of a storefront church on East Charleston Boulevard. He later moved the parish to 15 acres he purchased at Eastern Avenue and Flamingo Road, where he began the St. Viator School. The church and rectory served as a temporary base until the Guardian Angel Church was completed in 1963. The church attracts an average of 5,000 visitors each Sunday. Toomey received a master’s degree in psychology from the Catholic University of America, Washington, D.C., in 1940. 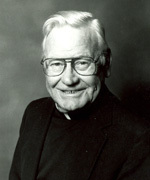 He was ordained in 1944 at St. Viator Church in Chicago. He served in World War II and the Korean War as a major in the Army Air Corps and later with the Air Force. Shortly before coming to Las Vegas, Toomey was mission procurator for the Viatorian Foreign Mission, which had missions in Japan, Formosa, West Africa, Chile, Peru and Colombia. During his time in Las Vegas, Toomey was a member of the board of directors of the Las Vegas chapter of the National Conference of Christians and Jews and was post chaplain of the Veterans of Foreign Wars, Post 9774. He also was a member of the Clark County Ministerial Association. Toomey left Las Vegas in 1970 to become director of the Pastoral Field Education at the Washington, D.C., Theological Coalition. Services were held at 3 p.m. October 15, 1986 at Queen of Martyrs Church, Evergreen Park, Illinois. Burial was at 10:30 a.m. October 16, 1986 at Queen of Heaven Cemetery, Hillsdale, Illinois.